As mentioned in the earlier blog post, today we were set the mini brief of creating a poster promoting an independent dorset which would be placed in Weymouth house, therefore me and the other members of my group (Aaron Baker: http://abaker.co/blog/ Daniel Burden: http://dan-burden.blogspot.co.uk/) brainstormed some ideas which we could use for our poster idea. In our brainstorm we first looked at what could set us apart from the rest of the UK, which lead us to thinking we could implement something about Dorset's natural beauty and that the possibly the UK is ruining the beauty of the UK. We felt that this could be quite a good idea to go on because we could use images of some iconic Dorset landmarks such as Durdle door. 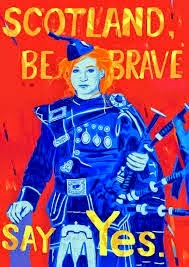 Another idea that we thought we could go on is the using iconic imagery of Dorset people, like what some of the Scottish independence posters had used. However apart from the stereotype that the dorset is fall of older people we could not find any iconic imagery such as the the Scottish kilt and ginger hair. We then though about going down the route of using famous people that had hailed from bournemouth and although we had thought that this could had possibly been a good idea, we felt that just because we a picture of a famous person that nothing about it would scream an independent Dorset. Scottish independence poster, playing on stereotypes and "Braveheart"
After some more research and brainstorming we decided to go on the line that Dorset was sort of an odd piece out, a puzzle piece that didn't quite fit. We felt that we could draw upon the counties beauty and over exaggerate the "greyness" of the UK to make people want to be independent. However when we pitched the idea we received mixed reviews with the most notable begin that it doesn't say make Dorset independent, it says Dorset is nicer than the UK. With this feedback me and the other members of the group will do some more research and create a poster that does say an independent Dorset.